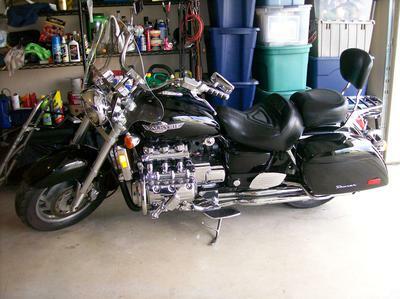 The 1999 Honda Valkyrie Tourer for Sale by Owner has just 31,200 miles; a low mileage motorcycle for the year! The bike comes with an Ultimate Seat with a backrest,Cobra 6 into 6 exhaust pipes, Cobra floorboards, Kurakyn grips, a new Slipstream windshield, engine frame adapter and extra chrome! The bike also comes with a Craftsman aluminum jack and a 1/2 cover. other Valkyrie touring motorcycles and then get in touch with me to talk about this one! If you would like to write a review or voice any opinions on the 1999 touring model Honda motorcycle for sale, you may use the comments form below this ad to do so. Thanks for visiting GoGoCycles Used Motorcycles for Sale and for taking a look at my 1999 Honda Valkyrie and you are most welcome to check out this 1999 Honda Valkyrie for sale as well as this Honda Valkyrie Motorcycle. My location is is San Antonio, TX Texas and in my opinion my asking price is cheap enough that it can't be beat on Craigslist or on Ebay; $6,595. If you want to take a look or have questions E-mail me for more details and specs of the Valkyrie and by all means mention that you found this ad on GoGoCycles Used Motorcycles and Parts for Sale www.gogocycles.com.